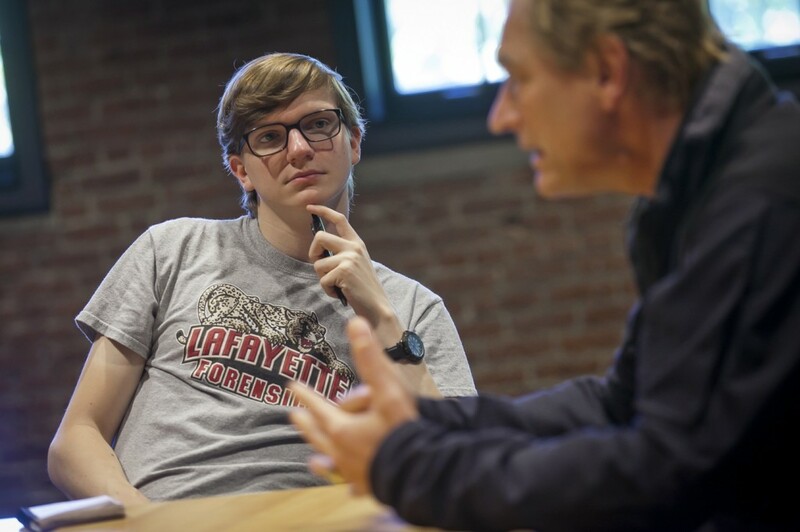 Joseph Rothschild ’16 listens intently to Julian Sands. Julian Sands let his curious statement hang for five seconds, a pause that could have been written by Harold Pinter, his late friend and Nobel Prize-winning playwright. Then the actor offered an equally curious explanation to Lafayette directing students on Tuesday afternoon, hours before they saw him perform his solo show about Pinter’s work, life, and legacy. It was one of a dozen practical, transcendental tips that Sands gave during a one-hour master class in the Studio Theater at the new Williams Arts Campus on North Third Street. He supplied the sort of nuts and bolts that help keep actors and directors from screwing each other up. Raised in England, the 57-year-old Sands is well known as a versatile, daring, extremely busy performer. Over four decades he’s portrayed Louis XIV, Tony Blair, Superman’s father, a spider scientist and a warlock (twice). His sublime creepiness and magnetic mystery make him ideal for Pinter’s bluntly poetic, gradually menacing plays, where the unspoken often matters more than the spoken. Sands led Tuesday’s class with the cool casualness of his outfit, a black ensemble topped by a windbreaker. His voice sang, his hands danced, he asked more questions than he answered. He was a gracious, generous guide to Pinter’s world, which he discovered as a high schooler. He described Pinter’s surgically precise scripts as musical scores, advising the students to direct them like conductors. He told stories about Pinter scolding actors seeking motivation in acts as mundane as speaking on a telephone. A monologue became a dialogue when students told Sands about the Pinter sketches they’re directing. Joseph Rothschild ’16 spoke of his actors being frustrated by Pinter’s many pregnant pauses. Sands advised the theater/English major to slow down their speaking, to help them consider the causes of the pauses. 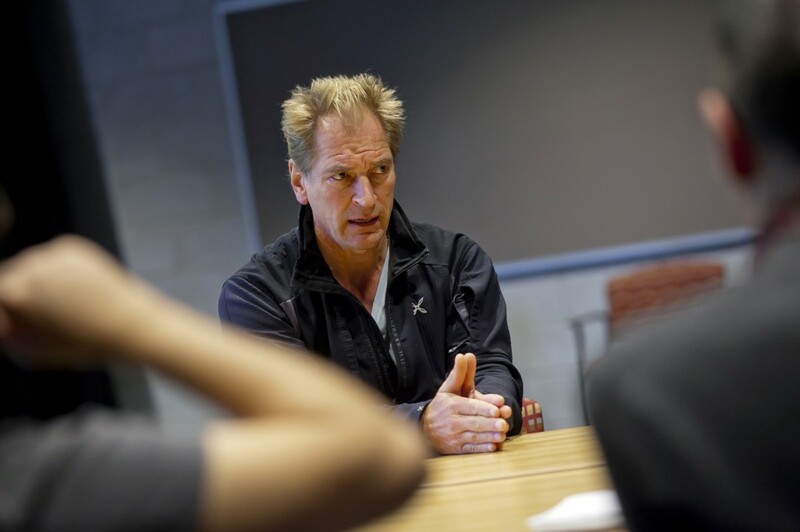 Julian Sands discusses his craft with students. Hannah Weaver ’17, a theater and psychology double major, appreciated Sands’ suggestion to focus on finding truths in Pinter’s texts. Economics and theater double major Danny Guadalupe ’16 admired Sands’ proposal to let actors test every idea. Andrew Morra ’17, a theater and film & media studies double major, was impressed by Sands’ passion and compassion. That night Morra and his peers watched Sands act his advice in “A Celebration of Harold Pinter.” Performing in the Williams Center for the Arts, Sands created a roaming, robust portrait through quotes, anecdotes, and renditions of Pinter’s poems about an influential teacher, a legendary cricket player, his first wife’s ghost, even the cancer that killed him. He blended startling shouts, seductive whispers and stabbing fingers. He earned big laughs for imitating Pinter’s agitated, imperious, lead-with-your-chin attitude. After the show Sands signed copies of a book of Pinter poems. Standing in line in the Williams lobby, Rothschild said he was moved by Sands’ touching interpretations of Pinter’s meditations on love, death, and eternity. Madeline Kraft ’18, a double major in theater and anthropology & sociology, savored Sands’ colorful demonstration of Pinter’s demonstration of a Pinter silence. The 13-second sequence involved two long drags on an imaginary cigarette, two flicks of ashes, and a stub ground under an invisible shoe. After the autograph session, a tired, pleased Sands mentioned a fourth actorly I: interaction with the audience.